Puppy Exercise: How much is TOO much? ….Any sensible caring owner is going to be thinking about this issue having bought a puppy. A mixture of experiences from any previous dogs you have owned, coupled with breeder advice (or possibly lack of! ), with a dash of scaremongering from well meaning ‘advisors’ may well have your head spinning on how much is too much? How much is not enough? Is I give my puppy too much am I causing it damage, and what’s the cutoff point for that ???? There is never going to be a definitive answer to this burning question. But, of course, there are sensible guidelines. The crux of the matter is, IF your puppy has sound genetically strong joints passed from its parents, and is not horribly overweight, in all honesty, it can take really quite a LOT of exercise without damage. However, how can we KNOW if it has sound joints? Well, hopefully, if you have done your homework, you will of bought from parents who both have at least been hip scored if not also elbow scored (although this is less common so don’t beat yourself up if one or both parents are not). In addition to BEING hip scored, hopefully both have GOOD hip scores, so therefore making buying from scored parents basically as worthwhile as possible. However its important to stress that doing so is you doing your very best to give yourself a head start in maximising the chance of your puppy having good strong genetically sound joints. It is not a guarantee of that, nature can be cruel and work in mysterious ways. However, the chances are stacked in your favour if your pups parents have good hip (and maybe elbow) scores. If they do not, then what this *means* is that if you are being sensible and realistic, you need to err on the side of caution and assume that possibly they have not, and therefore your puppy may of inherited some level of weakness. I am not saying at all that ANY young dog cannot have an accident or cause himself injury in a trip, fall, crash with another dog etc. But if they have genetically sound joints, the chances are they will ‘bounce back’ FAR more easily than if there is weakness there. Basically HEALTHY JOINTS ARE HARD TO DAMAGE, WEAK ONES ARE EXTREMELY EASY. However EITHER WAY, common sense is needed to be applied. The point being your puppy is a baby. Babies need to be taken care of because they cannot make rational decisions for themselves. They, like small children, run on adrenaline, especially during new and exciting experiences, and do not know ‘when to stop’. So YOU need to make that decision for them. As a young dog hits exhaustion point during exercise, damage can then start to occur pretty easily. Your puppy will not acknowledge he has hit exhaustion point. From his behaviour he may seem FULL of beans and up for it. Especially if interacting with other dogs. 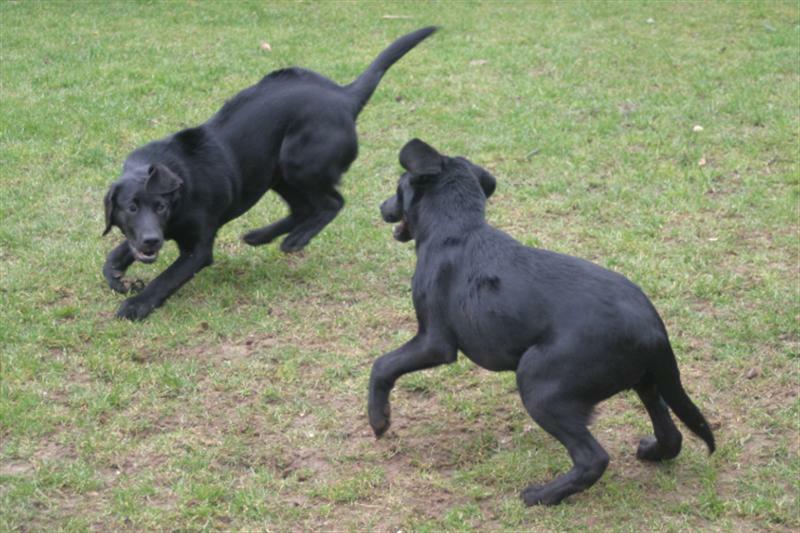 A puppy exercise guide, commonly considered helpful and useful, is called the 5 minute guide (or sometimes the 5 minute rule – but for me, there is no gun to anyones head on this, it is not a RULE, it is a helpful guide that owners should use as a ball park figure, NOT as something to set your watch by). The idea being that per MONTH of the pups life so far, 5 minutes of enforced exercise is given per DAY. So after puppy vaccinations are completed at about 12 weeks of age (so 3 months) (before which it is still VERY important to take your puppy out to introduce it to sights and smells, dogs, people, pushchairs, children, cars, buses and all sorts …. staying at home is NOT a sensible option in anyway….. See article: Keeping a Puppy home during its innoculations? ) you would allow 15 mins of enforced exercise. (3 months of age x 5 mins per month = 15 mins (or so!) of exercise. …. etc, up until about 11/12 months of age where upon the dog *should* be structurally less vunerable, any weaknesses will almost certainly have come to light if there ARE any lurking, and you proetty much have the green light to exercise your dog to your hearts (sensible!) content! Enforced exercise is NOT strolling or playing in the garden. It is not wandering about the house. It is exercise out on a walk, or hammering around training, where the puppy is away from home and either on OR off lead ‘out and about’. This is when basically the puppy is experiencing new environments, meeting other dogs and people and basically running on its adrenaline, or walking because you have decided its ‘time for a walk’. Around the house and garden, even if playing, at any point the puppy can decide ‘i’m tired, i’ve had enough, thanks’ and give up and flop down, put itself to bed or just lose interest and wander off. Basically a dog listening to its own body clock. Enforced exercise is when you have a puppy NOT able to listen to its own clock because new and exciting stuff is coming its way. * Again – this is a GUIDE. For a 4 month old dog, potentially ‘allowed’ 20 mins or so exercise, you may well find that 15 mins charging about with another young dog PLENTY before warning bells start to play in your mind that quite probably, enough is enough. However on or off a lead, going for a slow wander along a country path, stopping and sniffing here and there, meeting next to nobody and everything very calm and ‘non taxing’, half an hour would be just fine and non stressful. That amount of exercise per day can be split as you like. If your 6 month old gets 15 – 20 mins in the morning, and 15 – 20 mins in the afternoon, thats perfectly fine. If you only walk once a day, brilliant, put it all into one ‘hit’. Its a guide, take it, chew it over and work with it rather than feel ‘hemmed in’ by it. However it is proven a great guideline for our breed. Teaching a dog to ‘settle’ and accept a sensible level of exercise. And its true, the more exercise a dog GETS the more it EXPECTS and the more it DOES need to satisfy it. But that sort of level of exercise almost certainly WILL be having a detrimental effect on even genetically sound joints unless the owner REALLY is lucky. the other thing is, that the dog demanding 45 minsutes at 5 months old to wear it out, will need longer and longer as it gets older, not only causing real possible harm, but making an impossible mountain to climb some days for its owner, and creating a restless dog that won’t settle, always looking for the next ‘fix’ of mad exercise because it simply has not be taught to ‘settle and deal with feeling full of beans in a productive way’. What is a productive way? Doing a little training. 5 minutes of concentrated puppy training taxes the brain WAYYY more than any amount of mad running around. One to one playing. A full on ‘in the garden’ play session, (and not just chasing chasing chasing stuff thrown, which is not great for the joints either and just over adrenalises them) is so useful too. Hiding stuff and encouraging the dog to hunt about and find it is fantastic. Tug of war games, with sometimes you winning, and sometimes the dog winning is very bonding and useful for burning energy. Or more solitary methods such as Buster cube or a Kong where they have to work at the toy to get a treat reward are hugely useful. Think outside the box of ‘running around, running around’ as stimulation for a bored or needy dog. THEN when you have taken some time training or playing, teach the dog ‘enough’ and now you switch off. Put him in his crate, kennel or ‘bedroom’ (kitchen, utility room etc) with a biscuit, carrot or any ‘settle now’ treat, and leave him. Ignore complaints, give him a chance to learn to settle down and calm his own adrenaline. Get on with something else for a while and ignore him – and know you are teavhing him an important lifeskill, even if he doesn’t know it yet! I’m always happy to answer questions on any aspect of my articles which are unclear or help anyone who needs help!